They can be stood outside the greenhouse so that in the case of a late frost it will not take a herculean effort to bring them in again. One problem here is that the plants are in relatively small pots. The slightest breeze will have a tendency to blow your plants over. There is a chance that your plants may get damaged or that they may flatten other plants nearby. One solution is to take your plants into the garden. Decide where you want your plants to grow. Next dig a hole that will fit both pot and plant. 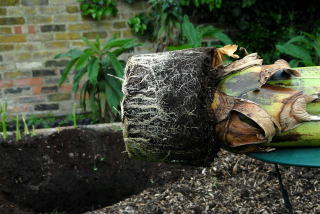 Planting Ensete Ventricosum in these holes in their pots will give them stability. It will also allow you the flexibility to quickly remove the plants back into the greenhouse should the weather forecast prove unfavourable. They next few weeks can be a little traumatic. Not for the plants - for you. 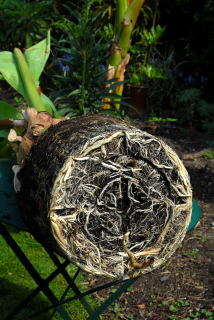 Some of the leaves, which, over winter, had been supporting each other or were supported by the frame of the greenhouse, begin to bend soil wards. Any wind does not help matters either. 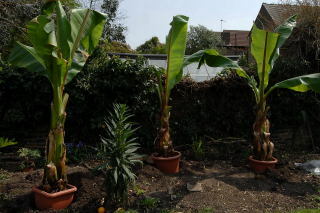 Still you will need to grit you teeth and the Abyssinian bananas will to their best to send up new stronger leaves. At this point it is important to remember that the old leaves make up the stem of the plant. Trim any bent or tattered leaves neatly with a sharp knife. 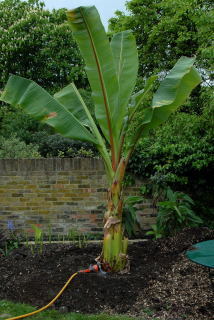 Once any danger of frost is over, planting Ensete Ventricosum in the soil can take place. As to when the danger of frost is over where ever you live, I'm afraid you will have to consult a local oracle. A mature vegetable grower is a good place to start. You will now need to enlarge and enrich your temporary planting hole. Move the plant out of the way. Make the hole about twice as large as it was before. You will now have a hole and a pile of soil surrounding the hole. Mix about 25 litres of blended farmyard manure and an equal amount of home made compost into the bottom of the hole and the surrounding soil. Test the depth of the hole by placing a plant in the hole. You want the plant to be a little deeper than the normal soil level. 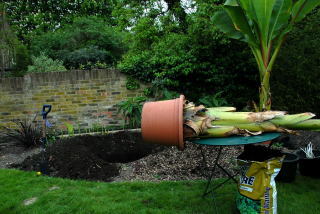 When you have finished planting Ensete Ventricosum, you want it to be in a slight crater. As such when you water the plant the water stays by the base of the plant. Otherwise the majority of water simply drains down to the edge of the lawn, causing the lawn edges to grow. Much of course, to the delight of slugs. 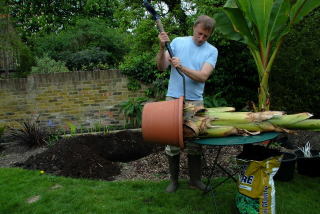 The best way to remove a plant from its pot is to hold it by the stem and tap the rim of the pot with a spade or trowel. In planting Ensete Ventricosum, this is easier said than done. The weight of the plants make holding them up with one hand challenging. If there are two of you, one can lift, the other can tap. If there is just one of you, find something sturdy like a garden table. 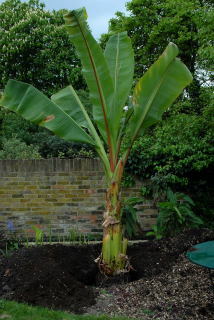 Place your Abyssinian banana on the table with the pot overhanging the edge. Before letting go, check that the plant will not roll off sideways or unbalance the table. It would be, to say the least, annoying at this stage to ruin your plant. 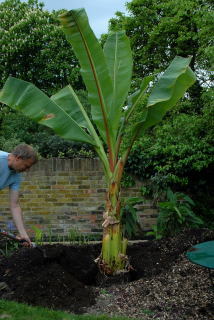 Ensete in new planting hole. Back filling with enriched soil. Firm the soil as you go along to give the plant greater stability. Then give the plant a good soaking. 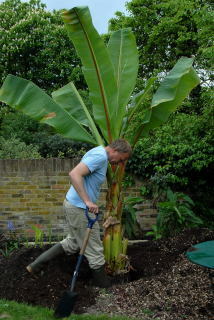 And that is that when it comes to planting Ensete Ventricosum.